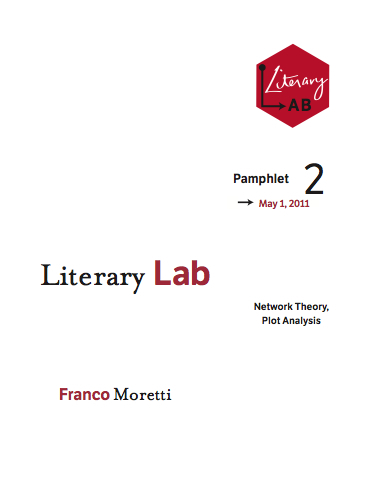 Moretti’s essay uses social network analysis (SNA) to chart the relationships among the characters in Hamlet and, among other things, examine plot as a spatial phenomenon and not, as is typically thought, just a temporal one. What’s SNA? It’s a methodology, developed by sociologists, for analyzing the structures of relations between individuals in groups. SNA typically graphs these relations (aka edges or ties) between individuals (aka nodes) in order to view their structure holistically, since it is that structure that in part determines the identity, attributes, and opportunities of individual nodes. A quick Google search will show you a lot of diagrams of people’s Twitter and Facebook networks. Here, for instance, is a map (made by Marc Smith), of the connections among the Twitter users who recently tweeted the words #rw2011 on April 28, 2011. The National Security Agency has used SNA to study the records of millions of tapped phone calls in order to locate terrorist networks. Epidemiologists have used it to trace the spread of disease. The artist Mark Lombardi fused SNA, Sol LeWitt, and Cy Twombly (“these are a few of my favorite things . . .”) in order to expose networks within and between corporate boards and governments. If you’ve ever played Six Degrees of Kevin Bacon you’ve basically played around with social networks. Literary studies has not done a great deal with SNA. 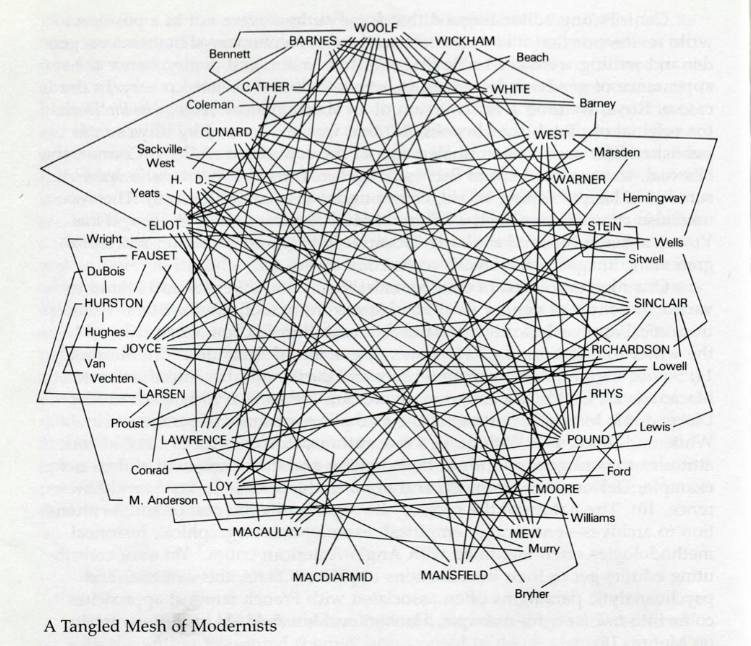 One notable exception is Bonnie Kime Scott’s map of modernism in The Gender of Modernism, although she wasn’t working formally with network theory–which is why the important notion of centrality (more in my post tomorrow) is absent from the diagram. Scott’s diagram suggests that in order to get a better grasp of what modernism was, we need to expand our purview beyond the ten or so figures we tend to focus on in modernist studies. I’d add on that we needn’t limit ourselves to authors or even individuals. Nodes don’t have to be humans, and edge relations can take lots of forms. We might fruitfully use the methodology to look at characters, genres, publishing houses, periodicals, and even themes in the literary field. Moretti’s essay, which is not at all about modernism, provides us an opportunity to think about the prospects of SNA for studying magazine modernism over the next week. We’ll be taking up this issue again at a roundtable at the Modernist Studies Association meeting (3:30 on Friday October 7) in Buffalo in October, so come by if you’ll be there. Read the essay. Comment below. How can you imagine using SNA to study modernism, magazines, and literature? And please add your comments to our responses, which will be about Moretti’s essay, about SNA, about Digital Humanities, and, of course, about what any of these things have to do with magazines and modernism. This entry was posted in Commentary and tagged esay club, Facebook, franco moretti, Ha, let, Literary Lab, magazines, Mark Lombardi, Modernism, SNA, social network, Stanford, Twitter. Bookmark the permalink.